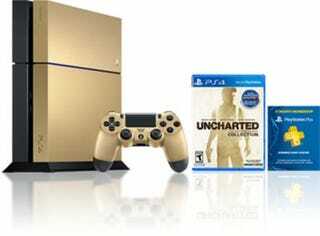 Do You Want This Gorgeous Gold PS4 Nathan Drake Collection Bundle? Do you like... Taco Bell? Look at that PS4. I mean, just look at it! Black and Gold. Gold and Black. So classy. So rich. Oh, and it includes Uncharted: The Nathan Drake Collection and a year of PS Plus! I want it. How about you? Do you want this gorgeous gold PS4 bundle? Okay great, then let me tell you how to get one! It’s really easy. Then you... go to Taco Bell. Then you order something called... a “Big Box”... which appears to contain something called a “quesarito” and other monstrosities no doubt made of mystery meat, cheese, and pre-prepared chopped veggies. Here, this website explains all the gory details. Look, I get that cross-promotional contests are a “great” way to drum up interest in your video game console, but seriously... I already own a PS4 and I literally would walk into a store, plunk down over $400, and buy myself a gold PS4 with all these fixin’s. In fact, I’d rather do that than pony up for $400 worth of *hurk* QUESARITO BIG BOXes. I just... I hope I can just buy this. You know, from the store. Not from some scalper. Not through the purchase of a bunch of food I don’t want or need. Just like, this awesome gold PS4 in a box with the game and controller and PS Plus voucher. Maybe that’ll happen. Maybe they’ll release a Nathan Drake Collection gold PS4 bundle and I’ll be such a happy camper. Or maybe I’m going to have to go to... urk... Taco Bell. ...do they still have that weird Mountain Dew flavor there? They do? Okay... at least I’ll get a cup of that with it. I guess.